We love our milsurp (military surplus) ammunition for our AK’s, but some of them are “corrosive” and require special cleaning after a range day. It isn’t if you follow our guide that covers why some ammo is corrosive and how to quickly clean it so your gun doesn’t rust. So what makes some ammo corrosive? It depends on the primers and whether or not they leave behind salts when fired. These salts attract water from the air and we all know what happens with water and metal and salt. For the chemistry guys out there, the primers leave behind potassium chloride or sodium chloride (common table salt) when burned. There’s two types of centerfire primers—Boxer and Berdan. Not sure what centerfire or primers are? Check out our Basic Bullet Guide. 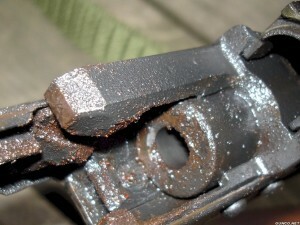 Boxer primers are not corrosive while some Berdan primers are. It’s better to play it safe and just think of all Berdan primed ammo as corrosive. Almost all corrosive ammo is older military surplus ammo. So why do we bother with this old stuff that rusts your gun? Simple fact is that they shoot great and are CHEAP. 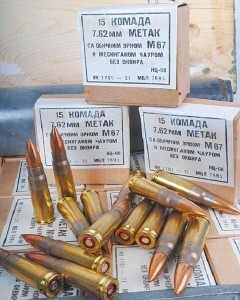 Our favorite ammo for our AK’s is the Yugo M67 shown above which is only mildly corrosive and also non-magnetic. They go for less than 20 cents a round while others such as PMC or Sellier & Bellot go for 50-70 cents each. But…they are getting rarer to find, so make sure to stock up when you can. We’ll be using an AK pistol for illustration purposes, but this overall method can be used for anything shooting corrosive ammunition. We talked about salts above and here’s a scary photo of what could happen if you shoot a lot of corrosive ammo and just leave your gun alone. We recommend cleaning it the day that you shoot, although in drier climates we’ve gone 24 hours with no signs of rust. There’s tons of methods out there, but to get rid of salts, you need to flush it out with hot water. Some other recommendations say to use soapy water, ammonia, or other water based cleaners, but it just boils down to water taking away those salts. 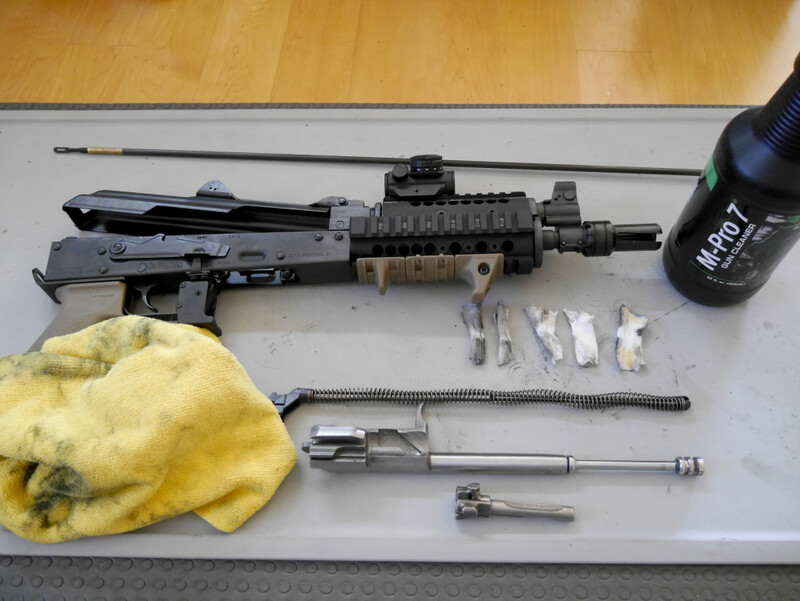 We field strip our AK and put it under the tap with really hot water and just let it sit for a few seconds. We like it as hot as possible since it will dry off much quicker. 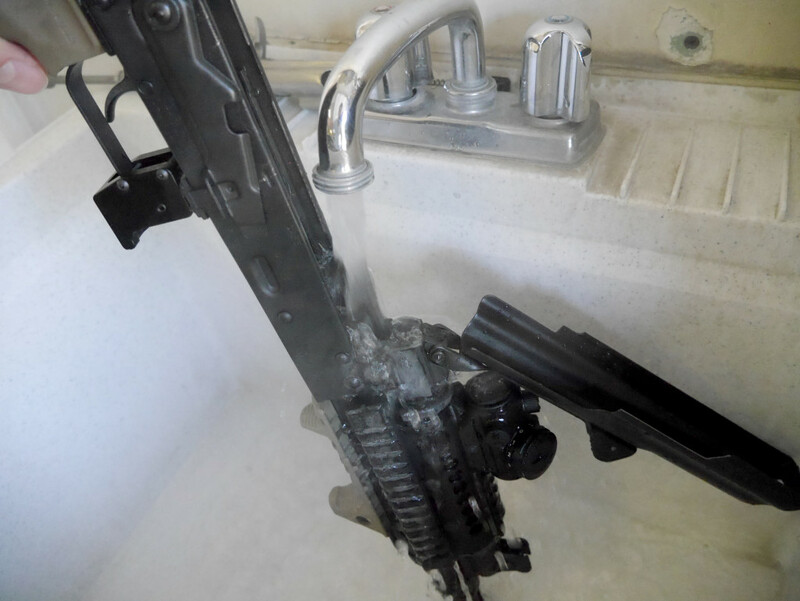 If your sink can’t fit a gun or can’t get as hot, just boil some water and run it through. Make sure the water not only goes through the barrel but also the gas tube where most of the salts will settle. We also run the spring, bolt, and piston through the water. Afterwards, just let the water dry and clean as usual! I have a Mosin-Nagant that I shoot occasionally, can’t get that thing in the sink not to mention the wood stock. What would be best for cleaning it? I soak a cotton patch in water to clean my mauser, It seems to work just as nicely. I also recommend putting a patch soaked in CLP through it after words to keep it from rusting. 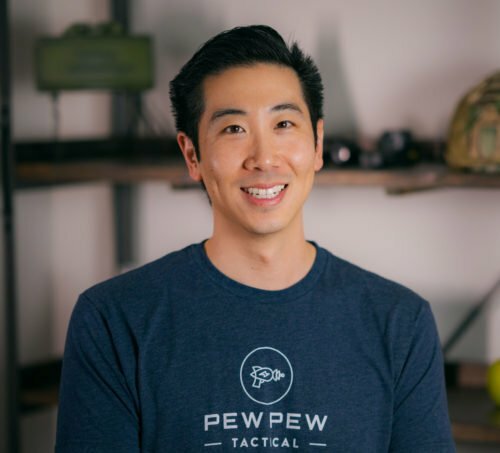 No gun is going to run any ammo without any issues, but anything you’re shooting corrosive ammo through is going to need to be cleaned a specific way to function reliably. 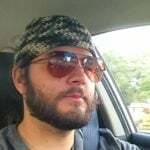 Even the legendarily robust AK will fail if not maintained properly, and with special consideration for corrosive ammo. Short, sweet & to the point, very good article.